Erik’s blog Brands & Films is about product placement – in movies, on TV, in song lyrics… The goal is to give opinion on good & bad examples, best or worst practices and at the same time have fun. “I will also try to rediscover my lost love for movies – which means I will have to watch old movies for the second or third time. But that’s OK because now I’m on a mission. 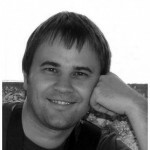 I’m a brandspotter.” Follow him on Twitter and check Brands & Films on Facebook. Paddy Power is not an underwear brand, of course. It’s an Irish bookmaker and is known for its controversial advertising campaigns and betting markets. Goal celebrations with football players lifting their jerseys and thus revealing different messages are not something new, but on the other hand they’re pretty common in those days. The first such goal celebration that I remember occurred in March 1997. 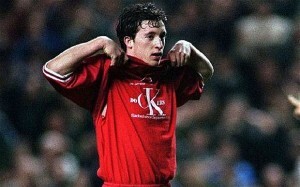 It was an infamous celebration by Liverpool striker Robbie Fowler after scoring against Brann Bergen. 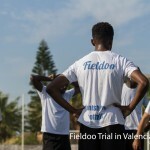 Fowler was then fined by European football organization UEFA for pulling up his jersey after to reveal a mock Calvin Klein T-shirt in support of striking Liverpool dockers. Fowler and his teammate Steve McManaman were members of spice boys and according to Wikipedia they had became well-known for pioneering (in the English Premiership) several jersey/T-shirt related celebrations with political or arrogant slogans. The pair would doodle these on T-shirts hidden under their jerseys, and unveil them before live television cameras after they scored goals. Taking jerseys off during the game eventually led world football organization FIFA to punish the removal of jersey during a goal celebration with a yellow card a decade later. 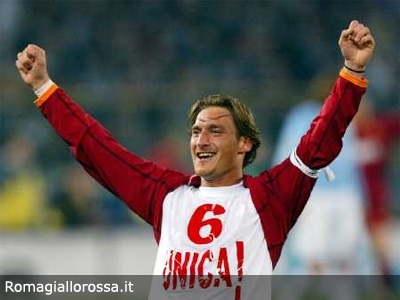 Italian forward and Roma’s captain Francesco Totti was also famous for his goal celebrations and showing various messages. Two of them were for his wife Ilary Blasi: ‘6 Unica’ (‘You’re the One’) and ‘6 Sempre Unica’ (‘You’re Still the One’) and there was also a political one ‘Liberate Giuliana’ (‘Free Giuliana’) in honor of Giuliana Sgrena, an Italian journalist kidnapped in 2005 in Iraq. Another Italian football player had problems with revealing messages under his jersey. 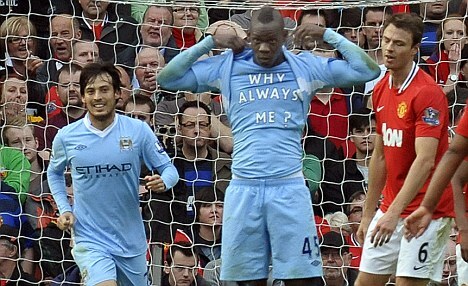 Manchester City’s striker Mario Balotelli got involved in several scandals during his career. One of them happened in October 2011 when Mario revealed a T-shirt reading, ‘Why always me?’, which was a message to the media, who condemned him after it was discovered that he had set fire to his house a few days before the match. This February Mario showed another message: ‘Raffaella ti amo’ (‘Raffaella I Love You’), which he wrote for his girlfriend Raffaella Fico. Raffaella is a 24-year-old Italian reality TV star-turned celebrity WAG, who was with Balotelli for several months. She’s now his ex-girlfriend following his antics with other women. Daniel (Dani) Jarque was a Spanish footballer who played as a central defender for Barcelona’s other club Espanyol. He was named team captain in July 2009, one month before his death from a heart attack, at the age of 26. Andres Iniesta, Jarque’s close friend, scored the winning-goal for Spain in the FIFA World Cup final in July 2010. When he celebrated his goal, he removed his jersey to reveal a T-shirt with the sentence ‘Dani Jarque siempre con nosotros’ (‘Dani Jarque, always with us’). Fabrice Muamba is an English footballer playing for Bolton. On 17 March 2012, he suffered a cardiac arrest and collapsed during the first half of an FA Cup match between Bolton and Tottenham. The next day Gary Cahill, Chelsea defender and Muamba’s former team-mate, scored for Chelsea and then lifted his shirt to reveal a message: ‘Pray for Muamba’. 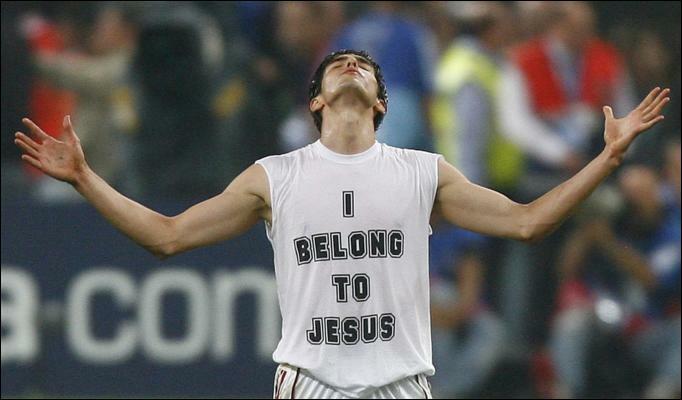 When Brazilian superstar Kaka played for AC Milan he had the words ‘God is faithful’ stitched onto the tongues of his boots. But one of the most iconic images of his faith in God could be seen in May 2007 when AC Milan beat Liverpool in the Champions League final. Artur Boruc is a Polish goalkeeper who used to play for Celtic in the Scottish Premier League. Before we come to the T-shirt incident you have to know that Poland is very Catholic country and there is a fierce rivalry between two teams from Glasgow: the Catholic Celtic and protestant Rangers. After Celtic’s won against Rangers in April 2008 Boruc revealed a T-shirt bearing the slogan ‘God bless the Pope’. These are some of the most notorious or memorable examples of celebrations with the use of T-shirts worn under jerseys. But what about the rules? We all know that if a football player removes his jersey after scoring a goal he’ll be punished with a yellow card. Today, on 18 June 2012, UEFA decided about Bendtner’s punishment. It’s severe and in my opinion too high. 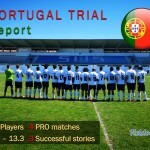 He’s banned for one game and fined 100,000 euros! The decision to fine Bendtner €100K for exposing his sponsored undies, when fines for racism are considerably less, is quite frankly, pants!